Minesweeping is back with a bang in the Royal Navy as it tests its first autonomous system to deal with 21st-Century mines. Motor boat Hussar can be sent off on missions, using a series of small, hi-tech boats trailed behind it to detonate the latest underwater explosive devices – potentially clearing minefields en masse. The Royal Navy last conducted real-world sweeps off Iraq in 2003 using remote-controlled boats, while HMS Ledbury conducted the final run out of traditional sweeping gear off the Isle of Wight in 2005. 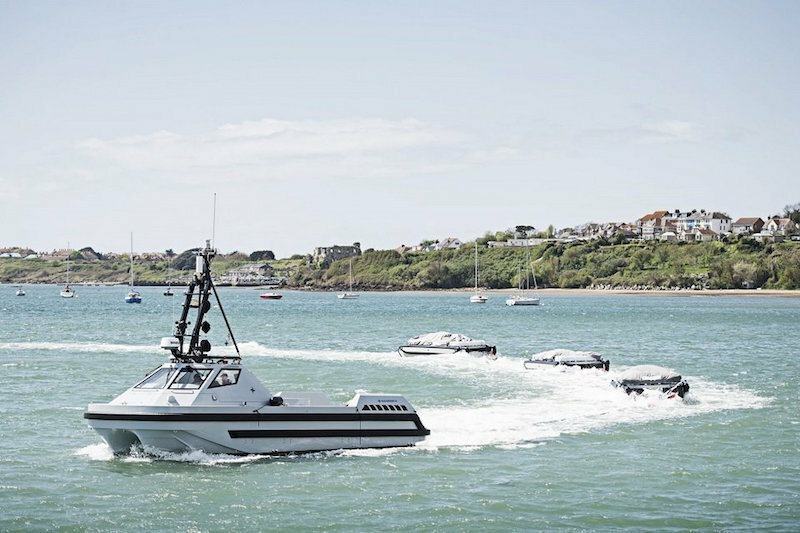 More than a dozen years later, the Royal Navy is on the cusp of returning to sweeping – but using autonomous boats, keeping sailors out of harm’s way. Following four months of successful initial trials and evaluation, Hussar – designed and built by Dorset firm – has been handed over to the Royal Navy’s specialist assessment team to assess, test, and determine how it might be used in action. “In the digital age, magnetic minesweeping was becoming obsolete – it goes back to World War 2. It could not deal with modern, digital mines,” explains Cdr Mark Atkinson who oversees providing the mine warfare branch with new kit. Modern mines can be sophisticated enough to take out a specific ship or class of ship if they know its signature – the magnetic, electric or acoustic field or noise generated by a vessel as it moves through the ocean. Hussar is an 11-metre-long ‘mother ship’ which is followed by the 21st-Century sweeping system, a series of small ‘coil auxiliary boats’ or CABs. The CABs are designed to replicate ship signatures to trigger the mines – and use lessons learned from IED blasts on vehicles in Iraq and Afghanistan to deflect and dissipate any resultant blast so that damage is minimal. “I’m a huge advocate of this form of sweeping. Everything so far has pointed to the system doing what we expect it to. When you see what it can do, it sells itself. But it is not the end of the minehunter,” Cdr Atkinson added. Some £13m has been invested in the system to date and, should the trials in the hands of the Navy’s Portsmouth-based Maritime Autonomous Systems Trials Team – better known as MASTT – go well, the intention is to invest in four Hussars with all their associated equipment and support. “It’s a very basic system which performs outstandingly when out on the water,” explained Lt Cdr Dave Stanbury of MASTT. “It’s easy to understand, easy to train operators. Above all it takes the sailor out of danger – you’d no longer have to send a minehunter into a minefield. After basic and signature trials at BUTEC, the British military’s underwater test centre and ranges in off Kyle of Lochalsh, Hussar will be sent to the Canadian Arctic to see how it operates in cold weather, then to the Gulf for the opposite end of the temperature scale.